The Thurston County Public Works Department used the Systemic Safety Project Selection Tool (Tool) (FHWA. 2013. Systemic Safety Project Selection Tool. U.S. Department of Transportation. Federal Highway Administration) to explore the potential benefits of proactive safety planning. Although Thurston County staff had experience conducting strategic safety planning in partnership with the Washington State Department of Transportation (WSDOT), those efforts focused on site-specific safety improvements such as turn lanes, guardrail enhancement, and shoulder paving and widening. Based on a review of severe crash data, Thurston County selected roadway departure in horizontal curves as the focus crash type. 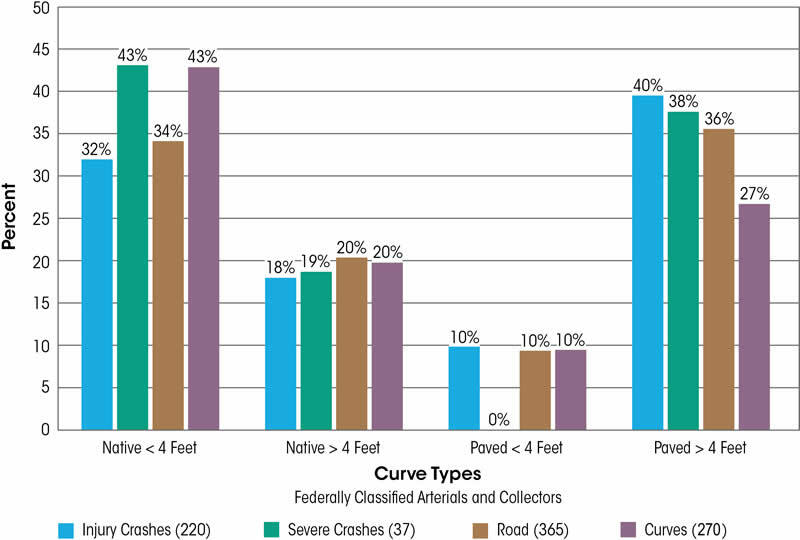 Because 81 percent of the severe curve crashes occurred on arterial and collector roadways, Thurston County chose curves on these roadway types as their focus facility. Because this effort coincided with ongoing efforts to identify and upgrade warning signs for signed horizontal curves on their County road system, Thurston County chose to apply the Tool to currently signed horizontal curves. Thurston County accessed an inventory of their roads and intersections through a database maintained by the statewide County Road Advisory Board. In addition, Thurston County assembled crash data for the 2006-to-2010 timeframe from the WSDOT crash database. Thurston County then applied a spreadsheet-based macro that linked the road, intersection, and curve data with crash data. These data were used – along with aerial photography and geographic information system (GIS) files – to identify risk factors as part of the systemic planning process. Thurston County assembled a list of 19 potential risk factors and then performed a descriptive statistics analysis to identify 9 risk factors for use in screening and prioritizing candidate locations. Based on the level of confidence resulting from the analysis, Thurston County decided that a risk factor could be worth one point or a one-half point. Those factors present in at least 30 percent of the severe (fatal and injury) crashes and overrepresented by at least 10 percent (when comparing the proportion of all locations with the proportion of severe crash locations) were used as a guideline to have a high confidence and assigned one point in the risk assessment process. The risk factors that had a lower confidence in their relative data were assigned one-half point. Figure 1 shows the results of analyzing shoulder type and width as a risk factor. Source: Thurston County Public Works. Note: Thirty-eight percent of severe crashes occurred in curves with paved shoulders greater than four feet, while only 27 percent of all reviewed curves have wide, paved shoulders. Because paved shoulders greater than four feet accounted for more than 30 percent of severe crashes and because the difference between crash locations and all locations exceeded 10 percent (38 percent to 27 percent = 11 percent), any curve with wide paved shoulders was assigned one point. Thurston County then tallied the number of risk factors present for each of the curves. The risk factor totals for the ten curves with the highest scores ranged from 4.5 to 6.0. All 270 signed curves were prioritized for potential low cost safety investments. Five low-cost, low-maintenance countermeasures with documented crash reductions will be systematically implemented at the signed curves: Chevron and Large Arrow signs, larger signs, rumble strips, barrier delineation, and extension lines. The Tool provided Thurston County a proactive, data driven and defensible approach to identifying curves for improvement prior to a severe crash occurring, rather than reacting after an incident has occurred. Upon conclusion of the systemic analysis, Thurston County applied for Highway Safety Improvement Program (HSIP) grant funding using the results as documentation for the request. The WSDOT approved the grant and the County is moving forward with implementing the systemic countermeasures identified through this systemic analysis. The Tool also proved to present a process that is flexible and implementable by a local agency with limited funding and staffing resources. A benefit of working with the WSDOT to apply the systemic safety planning process is that the experience provided County staff an opportunity for greater involvement in Strategic Highway Safety Planning (SHSP) activities.